I LOVE seeing the birds of Winter. I realized that something was different for me. I knew the larger bird was a Flicker. I happen to think Flickers are really cool, by the way. But, I had no idea what the other masked bird was. So, I knew what to do. I asked my buddy Bear. He always identifies my critters for me. A shrike? I am going to look that up! Thanks for sharing! I have birds up on my post too. Look like we had the came ideal this week. But I have never seen a flicker. I wouldn't have been able to name these birds. Cool captures, how much we get to learn! Nice shots of some very beautiful birds! 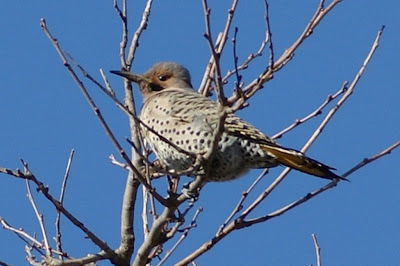 The shrike is great, but I had never seen a flicker before, beautiful birds. Ha, they remind me of The Lone Ranger & his masked buddy Tonto! Beautiful bird photos. I also love the winter birds - most of our birds here don't migrate though, we have robins and sparrows year round. Yesterday morning I heard the song sparrow sing for the first time though. Mostly they've just been trying to keep warm! I've never heard of either of these beauties! I've also never been able to get any good shots of birds with my little point and shoot! Yep...them Shrikes are gorgeous birds. Both the Loggerhead and Northern. But I also think Flickers are really cool. We have one which hangs out at our feeder sometimes. It's really nice to see him and the Scrub Jays together. Beautiful blue sky to compliment the birds, lovely to see! WOW... I never heard of a Shrike... that's so neat to learn of another bird!! Beautiful photos! Love seeing birds in trees looking at the world around! They look so much like kings of castles! Always wanted to see a shrike. Wonderful photographs. Shrikes are very rare here and I have never photographed one. It is good you were able to capture that one. I'm still trying to photo birds, yours are well done. What beautiful pictures! I know my camera can do that... it's just the photographer that doesn't. I'm hoping to keep up with Camera Critters again in the New Year! Nice shots. The Flicker bird has such a long beak doesn't it? I love the spotted belly. I don't believe that I have ever seen one of these birds before, nor a Shrike! Great job catching these birds. Both of these birds are very beautiful, Misty Dawn!! And I love the blue sky behind them too. Not only do I love its color, but also the way it shows the birds so much better. Lovely bird shots - envy anyone who can get close enough to capture their photo. Whoof!! Here birdie birdie. Nice birdies. Bark! I've never seen either of these bird before. Great captures! Misty: Really lovely captures of the birds. 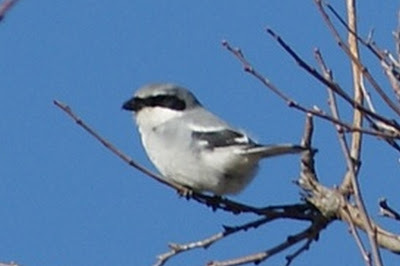 That Shrike looks like a cross between a Nuthatch and a Chicadee. A Shrike and a Flicker. Both beautiful birds and cool names! I've never heard of either before today. 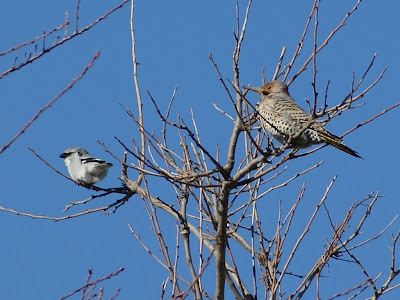 Nice to see that the flicker isn't afraid of the shrike. It's cool that you were able to get so close to get a good photograph of the shrike. Nice experience. thats cool to see 2 different types of birds together at same time. Came over from Camera Critters....just had to click on pic of a Border Collie pup!! Enjoyed spending some time on your blog...I write about life with my border collie on mine. :) I will be back to visit often.